The holiday season is upon us. Our family is preparing for the big Christmas day with cleaning, shopping, and baking! It is tough sometimes to set aside time to read my children like I do throughout the rest of the year because of all the endless chores. As I sit and write this blog I feel this is just an excuse and it is a waste of an opportunity to read some great great holiday literature. I found a list of the best Christmas books for 2009 to read to children. To plan for an author's birthday in my classroom I always limited myself to the books at my local library. I would just head to the library find the section that had the author's books we were celebrating and I would check out all the books. I looked through my lesson plans from when I taught Eve Bunting books. However, I focused on zero holiday books. That must have meant that my library did not carry Eve Bunting holiday books, or they were already checked out. This blog posting would not be complete if I did not discuss many of the Eve Bunting holiday books. As a disclaimer, I have not read all of these stories, but I have read a few. The book that I remember reading a while ago and remembered it as soon as I saw a picture of the cover was December . This is not your typical holiday story but that should not deter you from sharing it with your family. The story is about a homeless mother and son that share their cardboard box shelter with a stranger. The stranger is not there in the morning, but the child felt as if he saw an angel. It wasn't until a year later when things had turned around for the family that the child was given a sign that the visitor was indeed very special. Check out these other holiday stories - Christmas Cricket ,The Day Before Christmas ,Night Tree , andWe Were There: A Nativity Story . There were two Eve Bunting books that I read every year I did the Author Birthday Celebrations. The first was The Wall . 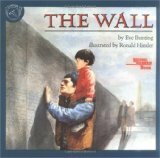 This story is about a young boy and his father's visit to the Vietnam Veterans Memorial in Washington D.C. The visit is all about finding the boy's grandfather's name. The story is very simple, yet educationally powerful. I loved reading this story to the 4th grade students. For most, it was the first time they had heard of the Memorial. Additionally, I was able to remind them of our Veteran's Day celebration we just had last month which helped tie it all together. 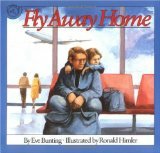 The second book I read every year was Fly Away Home . This story was about a homeless boy and his father that are currently living in an airport. I found a great lesson plan posted on the web for this book. I also did an activity called "Agree, Disagree, and Why?" with my students. This is a simple activity that could be replicated for any book, but I remember the discussions we had about homelessness after reading this book. The way the activity works is that you write statements on the chalkboard. For example, a statement appropriate for this book could be, "There is no hope for a person that is homeless." The students would read the statement and then write on a post-it note the word, "Agree" or "Disagree". I would then ask for students from both sides to explain "Why?" they wrote agree or disagree. This activity was great at starting discussions. I hope everyone has a Happy Holiday Season.